Villa Coco Jambo is located directly next to the Caribbean Sea and is part of the upscale Boca Gentil Resort on the island part of Jan Thiel. This villa boasts a beautifully landscaped garden, a private palapa (umbrella of palm leaves) on the beach and magnificent sea views. 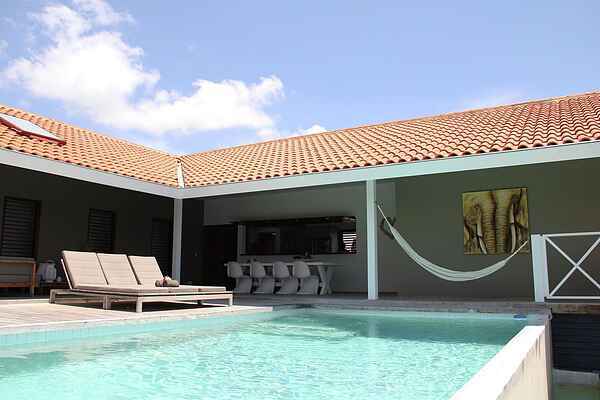 Top Architect Cees den Heijer designed Villa Coco Jambo and chose a Caribbean feel with a contemporary twist. Top stylists have provided an impressive 'private touch', which gives this villa this extra cozy, luxurious and special feel. This comfortable villa has a private pool with sun beds and an outdoor shower. From the veranda you will have a view of the swimming pool and the sea. The climate and the refreshing sea breeze will make outdoor living a very enjoyable experience. Willemstad is the capital of Curaçao. The city district encompasses multiple neighbourhoods, of which Punda and Otrabanda have always been the most important districts. Those who visit a website on Curaçao will, without doubt, be able to see a picture of the Handelskade. The eastern harbour district of the St Anna Bay is filled with Old Dutch facades. Behind the Harbour is the shopping district of the city.